Rogue's KG Rubber Hex Dumbbells are available in weights ranging from 2.5kg up to 60kg. The easy-grip handle measures 25mm in diameter for dumbbells weighing 2.5 - 5kg, and 35mm for dumbbells weighing 7.5 - 60kg. Most movements that can be done with a barbell become much more difficult when performed with a dumbbell. Handle Diameter: 25MM for dumbbells weighing 2.5 - 5kg, 35MM for dumbbells weighing 7.5 - 60kg. Heavy duty rubber encased head: minimize noise, floor damage, and wear and tear on the dumbbells themselves. Dumbbells are sold individually, not in pairs. For more versatility, check out the Kettle Gryp®. 25MM for dumbbells weighing 2.5 - 5kg, 35MM for dumbbells weighing 7.5 - 60kg. 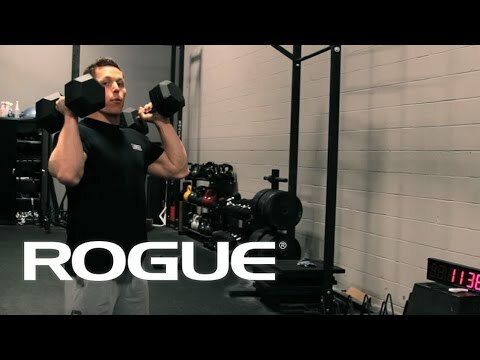 Rogue KG Dumbbells is rated 4.9 out of 5 by 19. Rated 4 out of 5 by Robj from Great product but strong oil smell Fast delivery, easy to use website and great product as far as I can tell, but it seems there is very heavy oil treatment applied so smell is taking up whole apartment. Hopefully that reduces over time, I can’t imagjne that professional gyms get the same oil treatment for their products. Rated 4 out of 5 by David01 from Good dumbbells, with room for product improvements I have purchased hex dumbbells from various manufacturers over the years. Bought a pair of 17.5 kg and a pair of 20 kg from Rogue. These are solidly constructed, as described and delivered quickly. Comparing to dumbbells from other sources, I would point out two minor issues: (1) the grips are serrated metal, which can be sharp / rough at spots. (2) quite a bit of black soot on the rubber cover. Luckily, these problems can be addressed by (1) wrapping medical cloth tapes on the grip and (2) spending some time wiping down the rubber cover with water and isopropyl alcohol wipe. Rated 5 out of 5 by Teasy from Great! Bought my third set of hex dumbells, once again fast delivery and great service all round, loving my Rogue gear! Rated 5 out of 5 by dizzy from Great Quality Solid as a rock. Also great for pushup handles since they wont slide on the floor. Rated 5 out of 5 by Teasy from Great in every way! Fast delivery and pruduct as expected is awesome. Very well made, solid and look and feel like they’ll take years of use and abuse!